Last night Liz, the Dean of Students, had students gather around the white board to break down the set-up in CSD. The building has been sectioned into Beach House dorm, Treehouse dorm, Quiet Zone, Food area, etc. to make the best use of the open space. The evening ended with a story read by Liz. 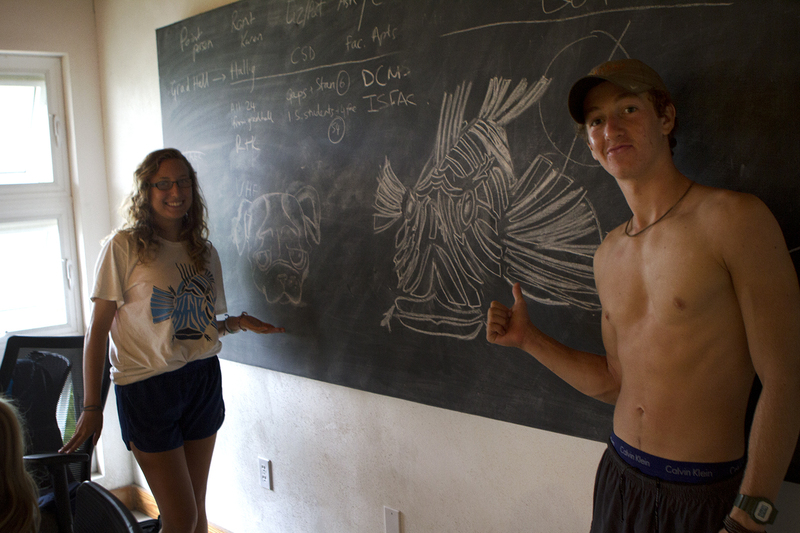 Interns have been housed with CEI and Island School faculty and staff on campus and at CEI Director Annabelle Brooks' house. The apartments are built well above any predicted storm surges. Our unique position on the western hook of South Eleuthera and off the Exuma Sound protects our campus from flooding. Nearly ten years ago, our campus weathered a Category 5 hurricane. The storm surge never came above the deck of our dining hall, providing us all reassurance in our position on the island. For information about how a storm surge might affect our location, please see this graphic provided by Weather Underground. The Spring 2016 Team Gap has had a great first few weeks. 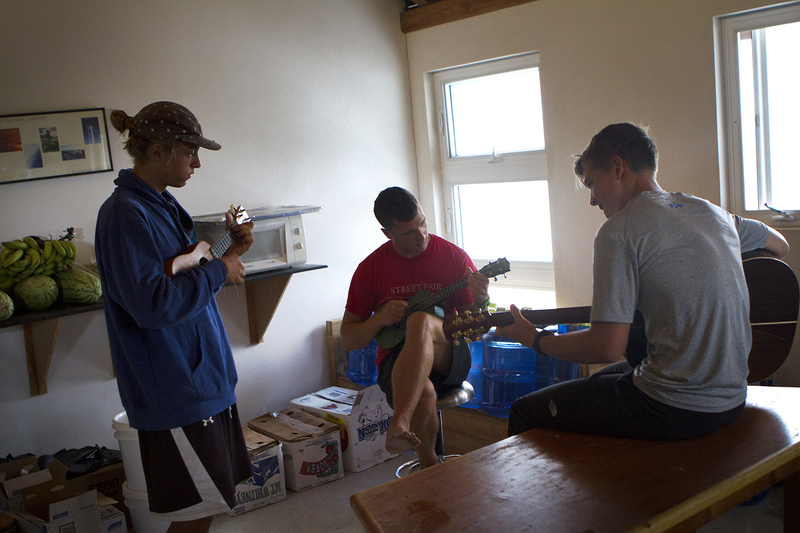 Everyone has gotten to know each other very quickly and we are all enjoying our time in Eleuthera. 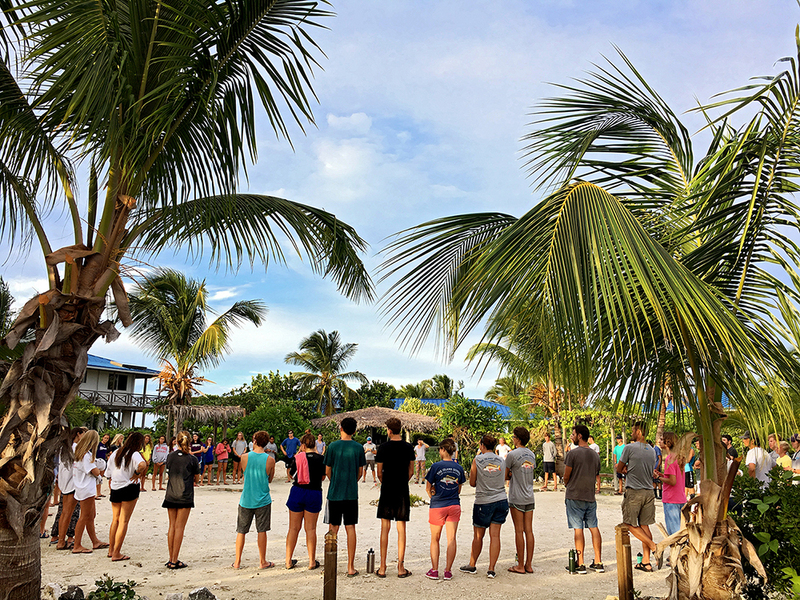 We began the week with some snorkeling introductions and began our marine ecology class, learning the fish of The Bahamas, and putting that into context learning about coral reef ecology. We wrapped up the week with a South Eleuthera road trip to learn about and see different parts of the island. Team Gap is looking forward to the next 8 weeks of learning and laughs. Stay tuned for more updates on our adventures. Education and research may be the staples of CEI, but they are just the tip of the iceberg. As part of the Gap Program, the students train throughout their semester for a culminating event- a Triathlon. Tuesday marked the third bi-annual Gap Triathlon. Comprised of three events, the triathlon aims to challenge the students using all aspects of our environment and our resources. Individually each aspect is more than manageable - ½ mile swim, 13 mile bike, 3 mile run; together they provide a veritable challenge for any competitors. In our typical unconventional style, each competitor must complete the triathlon on one of the schools beach cruisers, giving our triathlon an island feel. On Tuesday, nine competitors completed the course we have fondly come to know as the Talapia-thon (after our aquaponics system). The effort put into the event by the competitors was matched, if not surpassed, by the support the community gave during the event. Congratulations to all who competed, assisted, and cheered, and here’s to the next bi-annual triathlon later this year. Travel. A new place. A different rhythm. Novel colours, sounds and smells assail many a traveler as they set foot on foreign land. With this often comes the unmistakable adventure; something is just different as if the air itself was charged with anticipation. Arrival at CEI was no different (well maybe a little). With warm smiles and enthusiastic introductions, we were welcomed inside the community. The openness of those already here seemed to mitigate the shock of adjustment as we fell into the tight yet comprehensive embrace that defines the community. From Aquaponics and permaculture, to ocean research with conservation in mind, we witnessed stimulating, cutting-edge projects that radiated a vibrant atmosphere of purpose and progress to the facility. Being exposed to this environment where sustainability is the main focus in all aspects prompted a plethora of concerns and reflections shared by the Gap students in the Human Ecology and Environmental Issues classes. How we've lived here will undoubtedly influence the way we act in relation to our environment and resources for the better, inspiring those around us, as we were here, to achieve a society where we can live in harmony with nature and its flows. And so on we strive. Heading back a little in time, early February, we braved the cold and went on a kayak trip down to the settlement Green Castle. We learned how to create and sustain a fire using just one match; all of us achieved this! While out on our kayak adventure, we snorkeled at a blue hole where we were graced with the presence of five spotted eagle rays! Our time has also been spent diving. The boys started their advanced diver certifications, with one more dive, the night dive, to go! Research was a big theme, getting our hands into each of the different research teams. The adventure continued when we were on the island exploration trip, where our activities were as varied as surfing, heading down into the Hatchet Bay cave system, snorkeling with sea horses, jumping into a pristine blue hole, visiting Harbor Island, and also doing some community service at the Leon Levy Nature Preserve in Governors Harbour. Throughout our trip, we made gourmet camping meals and saw incredible views. We ended our trip with a 44 hour solo experience on Red Bay beach that gave time for reflection, for thinking about what this experience has meant, and the learnings taken from it. As we finish up the program, the team has been working on an internship with respective teams from both the Cape Eleuthera Institute and the Center for Sustainable Development. Emilio, a sharp young gentleman from Mexico’s heartland, is working in the aquaponics department. He has spent the past week digging the foundations of a new aquaponics bed, and he has loved every minute of it. Next, we have Caroline. She is working with the shark team, and although this is her first research experience, she is doing a great job assisting with video analysis of the deep water camera the Medusa, and also getting some field time. Last but not least, we have August. Born and raised in New York City, he wanted a taste of the country life, and has started work at the permaculture farm. While learning many essential farming techniques from a very hands-on perspective, he has started Haitian Creole lessons with some of the full-time farmers. All gappers will give a presentation on the work they have done in a few weeks time, and although slightly nervous, we are very excited to share what we have learned with the greater community.